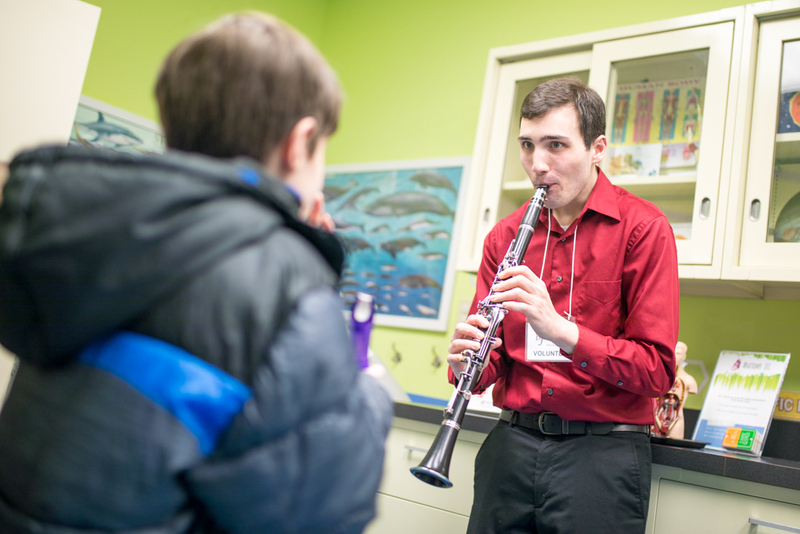 Junior music education major Robbie Chaplin spent a recent Friday evening in impromptu duets with a series of giggly children. As the budding musicians “honked” on the recorder, Chaplin played notes back with his clarinet. 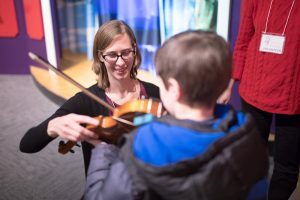 Christa Hoover, an instructor in the preparatory music program at Eastern Mennonite University, helps a young musician with a violin. “They thought it was funny and then tried to mimic the sounds by changing the notes and we would have a little back and forth between the two instruments,” he said. Honking—Chaplin’s own word choice—is an apt, animal-oriented descriptor for various sounds emitted during the second annual Instrument Petting Zoo held Feb. 1 at the Explore More Discovery Museum in Harrisonburg, though event founder David McCormick certainly hopes for more sonorous prospects for the young attendees. A classical string trio at the front door introduced melodious possibilities to young minds. Further inside the museum was the menagerie: violins, recorders, trombones and percussion—available to hold, touch, and play—with the help of friendly volunteers. More than 500 children and parents attended this year’s event, which was partially funded by an Arts Council of the Valley “Advancing the Arts” grant. Volunteers included faculty, staff and student musicians from Eastern Mennonite University and James Madison University. Kiwanis Club members also helped out at two instrument-building stations. Hannah Menefee, a senior music education major currently student-teaching in Harrisonburg City Schools, interacted with enough shy children during the three hours that she came up with a strategy: hand the instrument to the adult. And then there was the little girl who really did just want to hold the instrument and pet it. Faculty from EMU’s Preparatory Music Program offered information about lessons, offered year around, and Bach Festival concerts, held each summer at EMU. “We made a lot of good connections,” McCormick said. Getting kids hooked on music early is important, says Chaplin, who grew up in a musical family and eventually, played clarinet at Parry McCluer High School in Buena Vista, Va., in concert, district and area honor bands. At EMU, he sings with the University Choir and plays in three instrumental groups, as well as in a wind trio he formed with friends.